At the recent fall Symposium on the Advancement of Wound Care (SAWC), I had the honor of speaking at the opening session entitled, “The Power of Numbers, Predictive Outcomes in Diverse Populations” with 2 eminent statisticians, Charles Cowan and Nigam Shah. It sounds like a dry topic but the analysis of “real world data” could help ensure that our patients get access to the treatments they need. Here’s an example of why we need to change the way we do wound healing research. I had a patient who was a 72 y.o. woman with rheumatoid arthritis, on prednisone and methotrexate with poorly controlled diabetes (thanks to the prednisone she required). When I first met her, she had a 5-month history of an enlarging leg ulcer after hitting her leg on the coffee table. 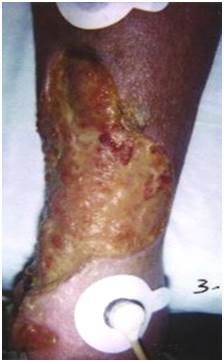 It was a terrible ulceration and was probably an inflammatory ulcer related to her RA. I healed her by preparing the wound bed with negative pressure wound therapy and then using two applications of a cellular product (she wasn’t a candidate for a skin graft). Given the circumstances, her outcome was pretty spectacular. But here’s the problem, I committed Medicare fraud to heal her. Why? Because the Local Coverage Determination (LCD) that my Medicare Carrier had in place at the time for cellular product use specifically stated that cellular products: “. . .must not be provided to patients with uncontrolled diabetes, vasculitis, rheumatoid arthritis or ongoing use of corticosteroids or immunosuppressants.” If that chart had gone to post payment review by my carrier, they would have asked for their money back. Why did the Medicare carrier word their LCD this way? Because all the randomized, controlled trials of cellular products use the same exclusion criteria and they all excluded patients on steroids or who suffered from any autoimmune diseases (there are a LOT more exclusion criteria for the typical wound healing RCT). Dr. Marissa Carter and I looked at all the exclusion criteria for every wound healing trial published between 1996 and 2006 (over 1000). We compared the exclusion criteria to the medical histories of 8,611 wound center out-patients. We found that > 50% of wound center patients have been excluded from 15 out of 17 of the major RCTs that were performed over that decade. In fact, we found that most wound care trials actually enrolled patients healthier than “the man on the street.” The Medicare intermediaries then took the exclusion criteria of the trials and crafted coverage policy that mirrored them. As a result, all those trials were “non-generalizable” to the wound care population we treat—meaning, the results really don’t apply to our patients. Clinical trials continue to be performed on easy wounds in uncomplicated patients. Not only does that mean we cannot use them in our patients, but it means that we don’t know if the products will even work on our patients. This means that the patients who most need advanced therapies will NEVER be allowed to have them. Next week we will discuss what the solution might be.